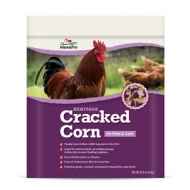 A blend of bugs that your chickens will love. These treats can be fed from your hand, scattered on the ground, or in our specially designed Coop Cups! 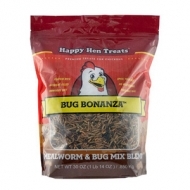 100% natural dried mealworm & bug mix. High in protein. Perfect for training or taming chickens. Purple Corn is Non-GMO & grown in the USA. 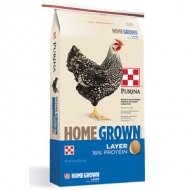 Good for mature birds, providing energy & diversity to your feeding regimen. Free of cholesterol, MSG & trans fats. 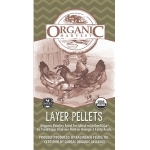 Premium grain, cracked, screened & cleaned for your birds. No artifical colors or flavors. 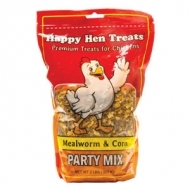 Get the party started and spoil your flock with a bag of Party Mix! 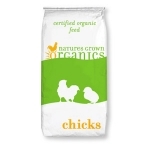 Contains natural and healthy ingredients that chickens absolutely love to eat. 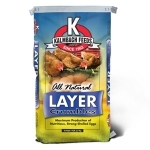 2 lb resealable bag for easy storage. 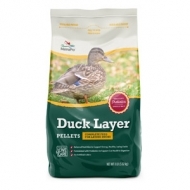 Fun, delicious, and healthy treat mix for your backyard flock. Perfect for training or taming chickens. 100 gm. 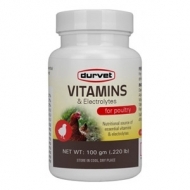 Durvet Vitamins & Electrolytes is a water soluble premix of essential vitamins and electrolytes formulated to be a nutrient supplement for use in all classes of poultry, swine, ruminants and horses. 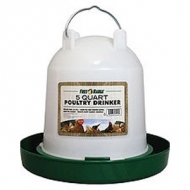 Easy-fill, easy-clean 5 Quart poultry drinker molded from long-life plastic with durable fountain. Features a twist-lock system and a hanger/carry-handle and accommodates up to 32 poultry or game chicks. 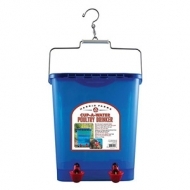 This easy-fill, easy-clean 6.26 gallon poultry drinker is molded from long-life plastic. 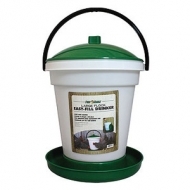 It features a top-fill bucket using a float in the base to allocate water to the rim. 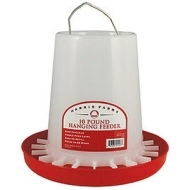 This drinker is excellent for indoor and outdoor use and accommodates up to 100 chickens or game birds. Made from long-life plastic, this open-top 10 lb. capacity feeder is designed for fast filling, easy cleaning and minimal waste of feed thanks to the no-scratch-out twist lock base. 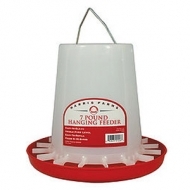 Feeds 10-25 birds. Made from long-life plastic, this open-top 7lb. capacity feeder is designed for fast filling, easy cleaning and minimal waste of feed thanks to the no scratch-out twist lock base. 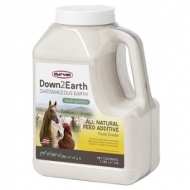 Feeds 5-15 birds. An opaque blue water reservoir inhibits algae growth, combined with easy twist off-and-on drinker cups makes this 4 gallon drinker a great alternative to messy conventional drinkers. Durvet® Layer Boost with Omega-3 contains a blend of vitamins, electrolytes, enzyme, omega 3, and Marigold for daily use with layer chickens. 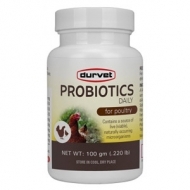 Contains a source of live (viable) direct fed microorganisms. 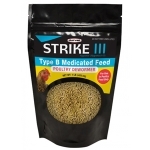 Strike III is a Type B Medicated Feed. 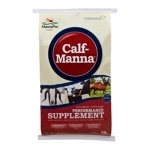 Use as an aid in the control of infections of the following intestinal parasites: Large roundworms (Ascaris galli), cecal worms (Heterakis gallinae), and capillary worms (Capillaria obsignata). Performance Poultry DuraStat with Oregano is a source of energy and essential oils for daily use to stimulate water consumption and appetite. 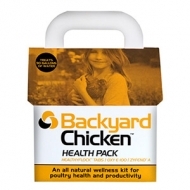 The Backyard Chicken® Health Pack is an all-natural solution to promote bird health by supporting a healthy digestive tract, sanitizing drinking water to help reduce exposure to harmful organisms and help maintain a healthy immune system without requiring a veterinarian prescription nor VFD (Veterinary Feed Directive). 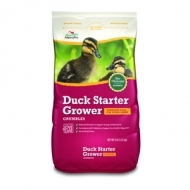 It can be used for all types of backyard poultry including chickens, turkeys, ducks, geese, guineas, pheasants, chukars, pigeons, waterfowl and any other form of domestic poultry. 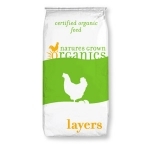 Derived from the same formula as our crumbles, this organic feed is fortified with essential amino acids and top calcium levels to produce strong shells and wholesome, tasty eggs high in Omega-3 fatty acids and Vitamin D.
An all natural, antibiotic-free complete feed with no animal by-products formulated for laying chickens. You nurture your hens. You feed them table scraps, provide them with a safe and comfortable home, perhaps even name them. All so you can reward them for the delicious eggs they provide for your family. 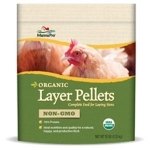 Now you can nurture them naturally with Manna Pro® Certified Organic Layer Pellets.